VANCOUVER, CANADA – Matthew Hornor, President and Chief Executive Officer of Kaizen Discovery Inc. (TSXV: KZD), today announced the signing of a preliminary agreement with strategic partner ITOCHU confirming that ITOCHU will partner with Kaizen and provide C$4.25 million to fund corporate and exploration activities on Kaizen's newly acquired Aspen Grove and Tanzilla copper-gold porphyry projects in the Canadian province of British Columbia. 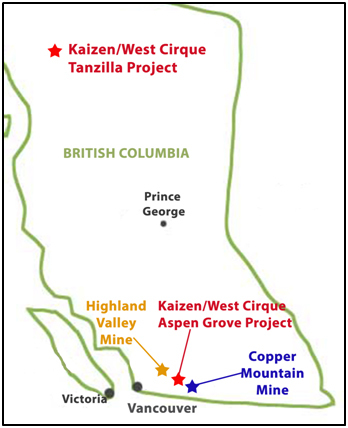 Kaizen gained control of the Aspen Grove and Tanzilla projects through an all-share transaction completed yesterday that gave Kaizen 100% ownership of Vancouver-based explorer West Cirque Resources. ITOCHU will use reasonable endeavours to arrange project financing and support from Japanese financial institutions for the development of the Aspen Grove and Tanzilla projects. Mr. Hornor said that the joint venture on the two Canadian projects is another indication of the significance of Kaizen's developing business relationship with ITOCHU, a leading trading house and supplier of metals to Japanese industry. "Kaizen is implementing its strategy of sourcing highly prospective projects, leveraging its financial and technical advantages and delivering on the opportunities available in this challenging market. By demonstrating its capacity to identify, acquire and finance highly attractive opportunities, Kaizen is distinguishing itself in the field and is building a case for continued growth and expansion." Mr. Hornor added, "We are thankful for ITOCHU's continued support and look forward to further opportunities to continue working together on our growing portfolio of international mineral projects." Tokyo-based ITOCHU originally invested C$5.1 million in Kaizen in February of this year and currently holds a 5.7% stake in the company following completion of the acquisition of West Cirque Resources. A framework agreement entered into between Kaizen and ITOCHU in January established a collaborative working arrangement under which both companies agreed to evaluate opportunities to explore and develop selected, high-quality, international mineral projects. A copy of the agreement is filed under Kaizen's profile at www.sedar.com. ITOCHU's investment under the preliminary agreement is subject to, among other conditions, receipt of all required approvals of the TSXV; the completion of definitive investment agreements; and the completion of ITOCHU's remaining due diligence investigations, which are expected to be concluded in the very near term. Since 2011, West Cirque has been focused on advancing exploration on several porphyry copper-gold prospects in British Columbia's main porphyry belts: the Early Mesozoic arcs of the Stikine and Quesnel terranes. 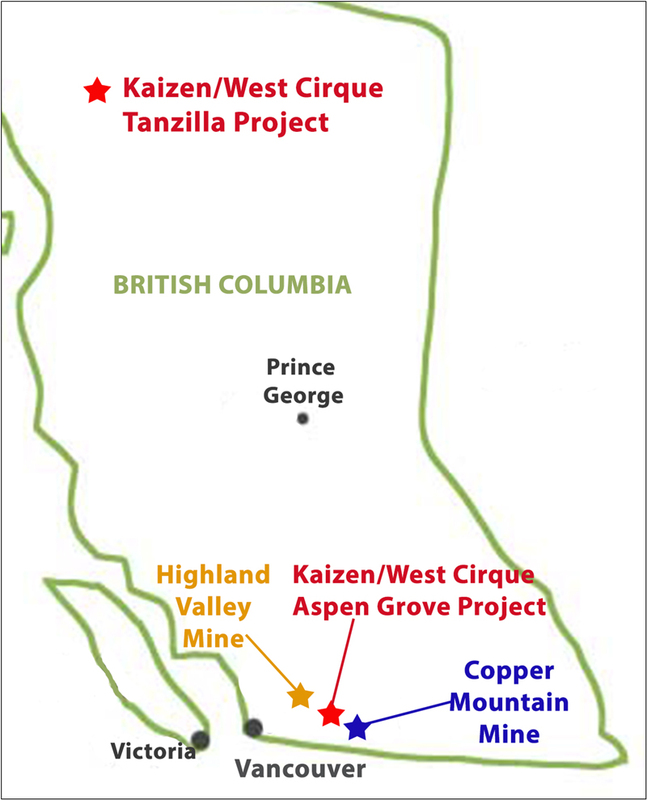 In the southern Quesnel terrane, West Cirque holds a large land position in the Aspen Grove copper belt, located midway between the Highland Valley and Copper Mountain mines. Initial exploration at Aspen Grove in 2013 resulted in the discovery of a significant porphyry copper-gold target at the Par prospect. At the Tanzilla Project, in the northern Stikine terrane, West Cirque has an agreement with Freeport-McMoRan of Canada that permits Freeport to earn an initial 51% interest in the project, although no interest has been earned to date. West Cirque's common shares ceased trading on the TSX Venture Exchange on July 8, 2014. The company now is a private Kaizen subsidiary. Forward-looking statements may include, without limitation, statements regarding the completion of definitive documentation for the investment by ITOCHU, receipt of TSXV approvals, satisfaction of conditions to the implementation of the investment, and the acquisition by ITOCHU of 40% of the Aspen Grove project and up to 25% of the Tanzilla project, and other statements that are not historical facts. Forward-looking statements are based on a number of assumptions and estimates that, while considered reasonable by management based on the business and markets in which Kaizen operates, are inherently subject to significant operational, economic and competitive uncertainties and contingencies.